Tucked away in the corner of of Brockley and Ladywell Cemetery is a squat, unremarkable family tomb, it is easy to ignore when passing but it is the family grave of the Hilliers and contains the remains of George Lacy Hillier, one of leading Victorian amateur cyclists and cycling administrators. It is hardly possible to overestimate the important of George Lacy Hillier in British cycling in the 1880s and 1890s … A fierce propagator and defender of ideological amateurism and denigrator of commercialism and professionalism…. George Lacy Hillier was born in Sydenham on 6 June 1856 (1) – his father was from Bloomsbury and a member of the Stock Exchange, his mother from Bognor Regis. He seems to have been a sickly child and he was sent away to school (2) – the 1871 census had him at the Temple School in Brighton, perhaps to get the ‘air’. He had competed in the 50 mile Championships in 1880, but there was no mention of him finishing – he certainly didn’t get onto the ‘podium’(3). 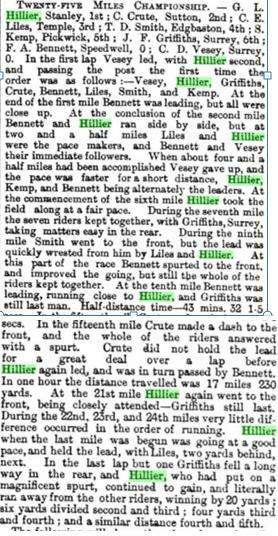 There were some glimpses on what was to come in the autumn of 1880, he won a mile handicap race at Crystal Palace (4) and was placed second in a tryicycle race from Finchley to Hitchin and back against some of the leading amateurs of the day (5). 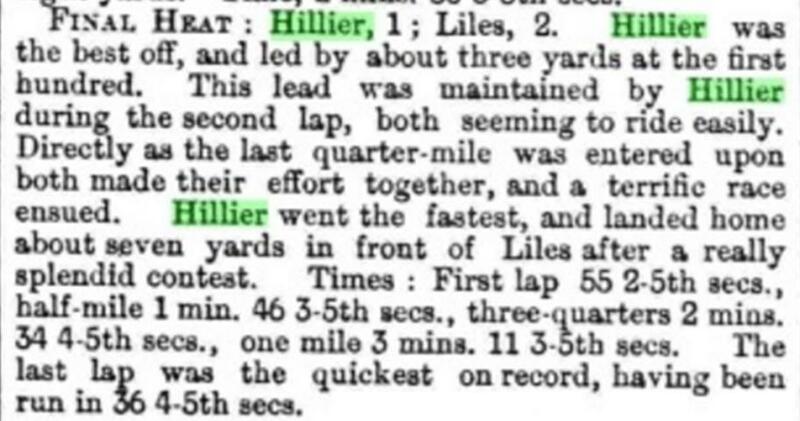 But in early season races in Leicester (6), at the Kennington Oval, in front of 4,000 spectators (7), and at Alexandra Palace (8) he was winning races comfortably at a variety of distances. With the 25 mile race Lacy Hillier seems to have been content to let others stay on the front making his decisive move on the 21st mile, holding the lead until the end (10). About a week later he added the 50 mile Championship at Surbiton to his palmarès, winning by 40 yards at the finish (11). He ran too, competing at cross country for South London Harriers (13); he race walked for the London Athletic Club (14), and, according to his obituary (15) he was also a good swimmer. A hundred years later he might have been an international triathlete. He was frequently reported in the 1880s and 1890s press reports as an official and timekeeper; he also wrote a massive Handbook of Cycling, which one of the reviews suggested that while ‘ the quantity is great, the quality does not equal it.’ (16). He was passionate about the amateur ethos of the sport – as a wealthy member of the Stock Exchange throughout his riding career, he could afford to be, at one point wanting those who earned their living as delivery cyclists classed as professionals (17). 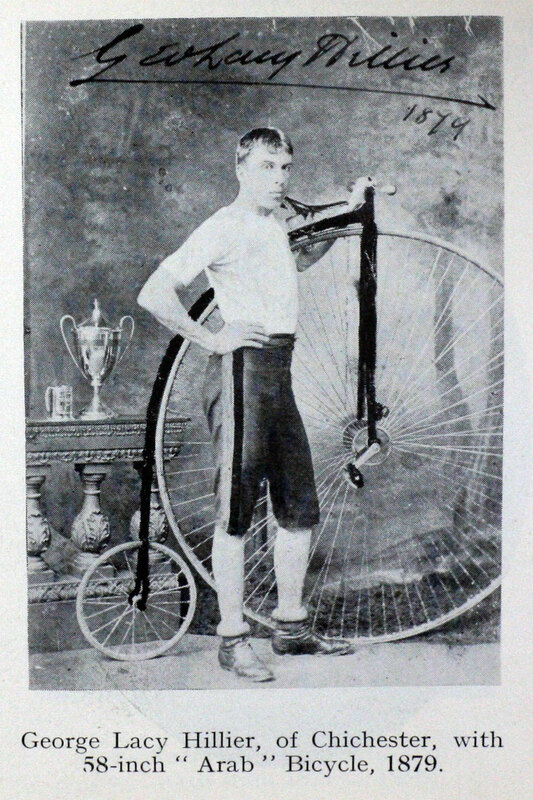 While not competing, he continued riding – he was prosecuted in 1897 for the fantastic offence of ‘riding a bicycle furiously’ with the police estimating his speed on College Road in Dulwich at a moderate 12 to 14 miles an hour (18). Lacy Hillier died in 1941- his Times Obituary (19) also lists him as writing two novels ‘The Potterers Club’, a now out of print cycling novel, which he launched at the 1900 Cycle Show; the other was ‘The Weston Diamond’ about which little is known. 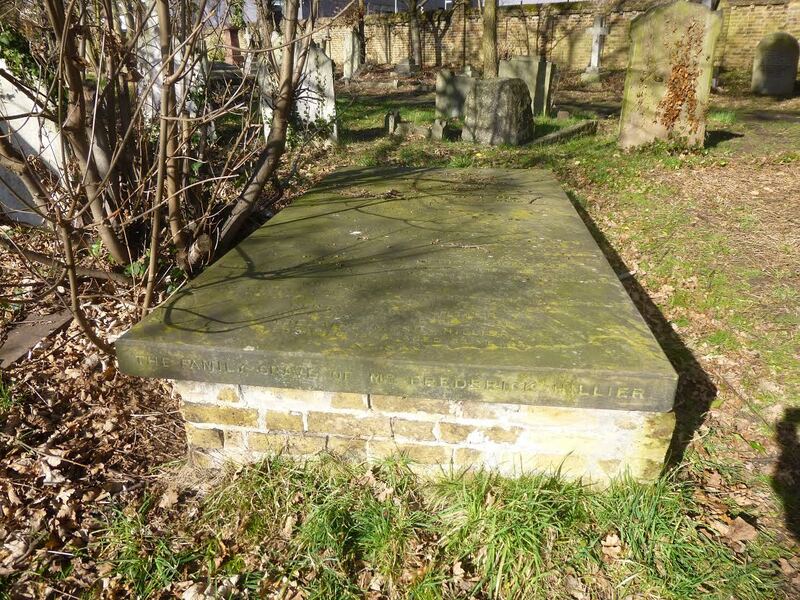 Despite having moved to Chichester in his latter years, he is buried in the family grave close to the north-eastern corner of Brockley and Ladywell Cemetery. Leicester Chronicle and the Leicestershire Mercury (Leicester, England), Saturday, April 23, 1881; pg. 2; Issue 3658. The Graphic (London, England), Saturday, May 7, 1881; Issue 597. Leicester Chronicle and the Leicestershire Mercury (Leicester, England), Saturday, July 23, 1881; pg. 2; Issue 3671. The Newcastle Courant etc (Newcastle-upon-Tyne, England), Friday, July 29, 1881; Issue 10778. The Leeds Mercury (Leeds, England), Saturday, September 12, 1885; Issue 14799. Penny Illustrated Paper (London, England), Saturday, December 05, 1885; pg. 362. Reynolds’s Newspaper (London, England), Sunday, April 13, 1884; Issue 1757. The Pall Mall Gazette (London, England), Friday, May 20, 1887; Issue 6918. “Police.” Times [London, England] 11 Aug. 1897: 9. The Times Digital Archive. Web. 15 Apr. 2016. The census and related information come from Find My Past. 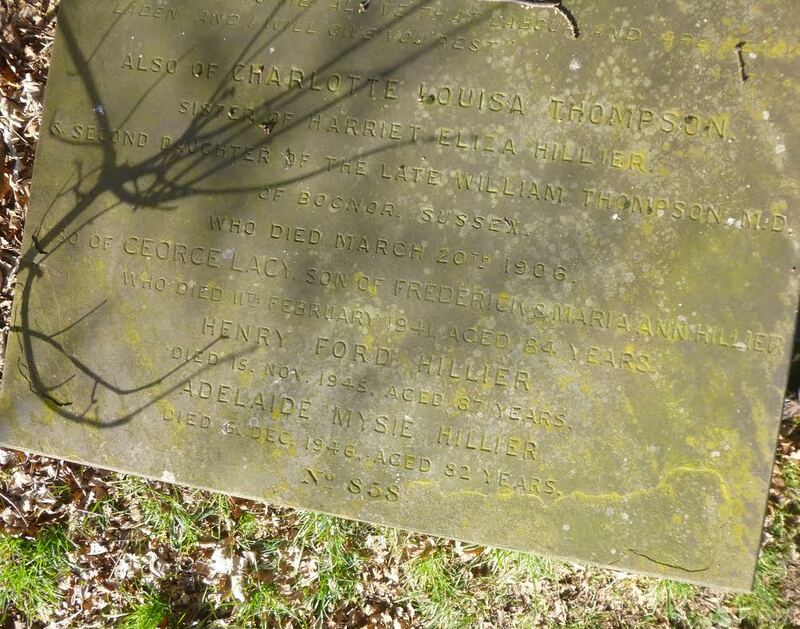 This entry was posted in Lewisham History, Sporting & Aviation Pioneers and tagged Brockley & Ladywell Cemetery, George Lacy Hillier on May 11, 2016 by Paul B. Another excellent post – GLH sometimes features on Foblc guided walks , his grave lies close to that of another sports giant Chess Supremo Henry Blackburne who could pack a punch ( literally) with his moves!.. Will look out for Henry Blackburne, not sure whether it is on the map you put up in the chapel, which I photographed. If not might I might ask you for ‘directions.’ I have a fascination about the early sporting heroes.